More Leaked Emails Reveal More About Joe Paterno's Preference To Play By His Own Rules. But Where's It All Going? Freeh Investigation Report Said To Be "Tough On Paterno"
She criticizes Paterno for wanting to limit the Campus Code of Conduct to incidents that take place on campus and keeping disciplinary matters involving his players private. "Coach Paterno would rather we NOT inform the public when a football player is found responsible for committing a serious violation of the law and/or our student code — despite any moral or legal obligation to do so," according to her e-mail. In the same e-mail, Triponey, also refers to calls her office was receiving from coaches and others. "I must insist that the efforts to put pressure on (Student Affairs) and try to influence our decisions...simply MUST STOP," she writes. Curley, in a subsequent e-mail, acknowledges that Triponey's take on the conversation with Paterno is accurate. Triponey replies to Curley, "I know you are caught in the middle of a very difficult situation," an apparent reference to appeasing Paterno. In a subsequent e-mail to then-Penn State President Graham Spanier she is more blunt: "I am very troubled by the manipulative, disrespectful, uncivil and abusive behavior of our football coach," she writes. Some Penn Staters have noted that Triponey left a legacy of trampling students' rights during her time as an administrator at both UConn and PSU. But none of that proves she's being dishonest here, which is what's really the issue. The Freeh report is clearly trying to establish an institutional pattern, but to what extent? Sandusky was the impetus for Freeh's investigation, so the pattern suggests the Penn State football program's desire to discipline itself contributed to an overall climate in which Sandusky's behavior went unreported for so long. But what does "very tough on" Paterno mean? 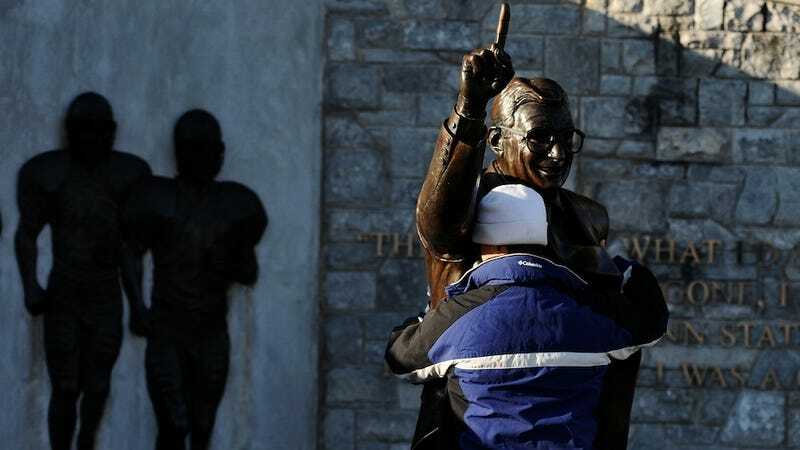 Will the report clearly demonstrate the influence Paterno supposedly had over his superiors, who were certainly capable of making their own decisions? What will the report say about the board of trustees, the group that hired Freeh (and that, incidentally, fired Paterno and Spanier, the two men most implicated by the recent series of leaked emails)? And what recommendations will the report be making? The leaks have been helpful, but by now it just might be best to wait for Freeh's full report to be made public.